“The Heart of a Dog” cost Mikhail Bulgakov dearly, yet today it still seduces readers. In times of crisis, the literature of this great Russian writer is good therapy to combat pessimism. Mikhail Bulgakov wrote his tight, absurdist masterpiece, “The Heart of a Dog” in 1925, but it would not see the light of day in the Soviet Union until 1987. Thus was the beginning of Bulgakov’s long and tortuous relationship with political power. The U.S.S.R. was not a good place, nor was it a good time, to write with a biting sense of humor. When he settled in Moscow in 1921 and quit medicine to pursue journalism and literature, Bulgakov began to explore the contradictions of socialism, the problem of housing, and the absurdities of bureaucracy. In short, Bulgakov reflected upon the preoccupations of Muscovites and the rules that governed life in the city. Bulgakov died a neglected figure, a stateless person in his own country. The year after he arrived in Moscow, the OGPU (the secret police of the Soviet Union from 1922 to 1934) started keeping a secret file on the writer. The apparent motive is trivial: Bulgakov published an article in a Berlin magazine announcing his intention to create a bibliographic dictionary of contemporary Russian authors without distinguishing between those who lived in the Soviet Union and those living in exile. This news was received with suspicion by the government: Writers who lived abroad were considered enemies of the people. “The entire work is written in hostile tones and breathes an infinite contempt upon the Soviet order…,” the writer of the report concluded. Suspicions about the writer began to grow and the OGPU tracked his movements. It was right at that time when Bulgakov began to enjoy some success thanks to the publication of his first novel, “The White Guard,” and also “Diavoliada,” his collection of satirical stories about Soviet life. Mikhail Bulgakov and the heart of a man: can evil support good? On May 7, 1926, the police searched his house and confiscated “The Heart of a Dog” and three diary notebooks. 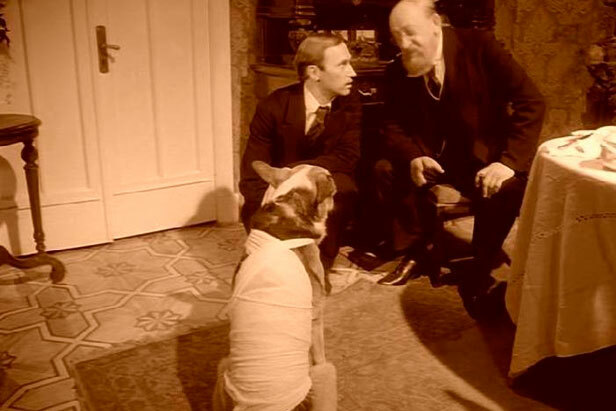 In “The Heart of a Dog,” Bulgakov depicts a present-day doctor who, seduced by the scientific spirit of the time, performs a transplant of certain organs from a criminal’s cadaver to the body of Sharik, a street dog in Moscow. Doctor Philip Philipovich intends to study the influence of the pituitary gland and the testicles on the rejuvenation of the human body, a plot which at that time must not have been considered as crazy as it would be now, for after the October Revolution there was an eruption of feverish activity in all areas of knowledge, including medicine. Bulgakov, as a doctor, would surely have been aware of his colleagues’ research. In the novel, the experiment triggers an unexpected result. The mongrel adopts the features and characteristics of the man, including his intelligence. When Sharik becomes aware of his new identity, he rebels against his creator, criticizing his counter-revolutionary spirit and his bourgeois existence. When Sharikov (his new name) becomes a man, he becomes a repulsive, rude and aggressive “comrade” for everyone, especially for Philipovich. By that time, this master of Russian literature had endured a career laden with troubles. His novels ceased to be published; his plays were continually censored; his determination to emigrate was never seriously considered by Stalin. However, time has done him justice. Mikhail Bulgakov is considered one of the bastions of universal literature. Readers the world over, have surrendered to his power of seduction. Now, as then, Bulgakov’s irony can save us from pessimism—and perhaps even from despair.